You can continue to fine-tune your image by selecting the RGB Image Adjustment button, found at the top of the Tool window. Here you'll find what looks like a traditional histogram. 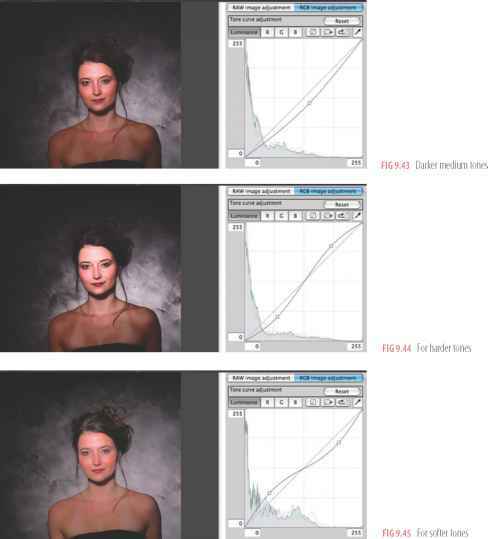 While it shares some of the functions of a histogram, it's actually a Tone Curve Adjustment and, as such, combines the best of Photoshop's Levels and Curves with some additional features FIG 9.41). 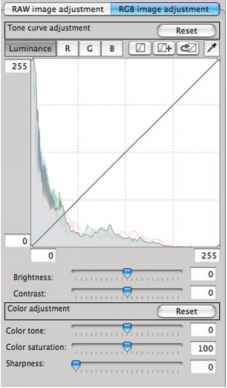 As with Photoshop's Curves, you create a break point by clicking and dragging certain portions of the graph line, changing the tones, contrast and brilliance of the image. 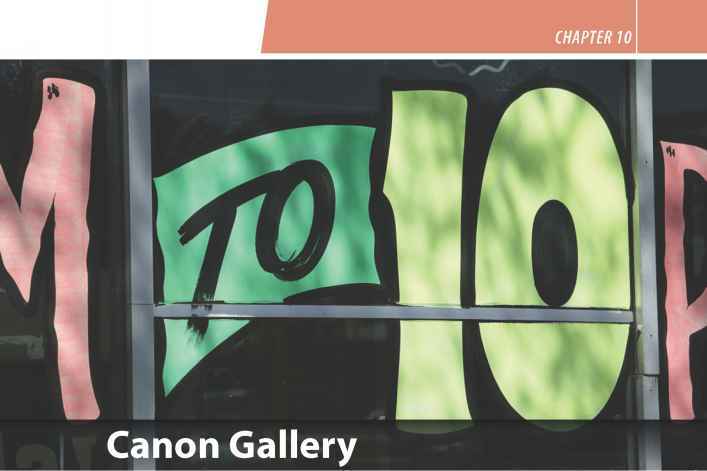 For general corrections, Canon recommends the following basic curves (FIGS 9.42-9.45). At the top of the chart, you'll see eight boxes; RGB (changeable to Luminance in Preferences), R, G, B, plus four others. Selecting any of the RGB channels allows you to make a Tone Curve correction to just that channel. So, while Luminance mode allows us to make general corrections over the full RGB spectrum, Luminance, along with changes made to the individual Red, Green, or Blue channels, provides more than selective retouching, individual RGB tweaks provide even more creative opportunities. You can place up to eight break points on each of the four lines FIG 9.46). If you want to take the easy way out, you can allow DPP to make tone curve decisions for you. 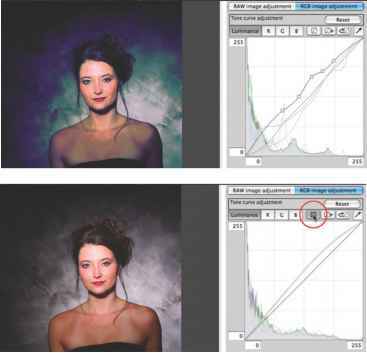 DPP will make corrections based on image analysis and create a new tone curve that reflects that analysis. Simply click the first of the next four buttons, Tone Curve Assist - Standard (FIG 9.47), and DPP will do the work for you (FIG 9.48). 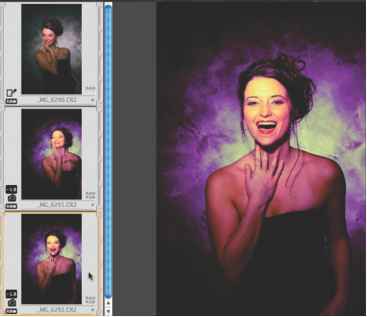 If you're working with a more difficult image, move your cursor over to the next button, Tone Curve Assist - High :IG 9.49). This button allows a major assist that may be able to rescue a severely under exposed image but, like the Standard Assist button, it's a quick fix only. You'll get much better results if you take the time to attack each problem within your image; exposure, color, and white balance, separately IG 9.50). can either select Reset or just click on the third button (FIG 9.51 . Selecting either will void the tone curve adjustment and return it to default. Finally, just in case you missed this before, Canon's placed another white balance eyedropper IG9.52) right where you need it. Click on a white or gray portion of the image to neutralize the image. Because most of the items in the drop down menus are duplicated as buttons or selections in the Tool palette I was able to do everything I've shown you so far without using any of those menus. There are a few very exciting and innovative items hiding in menuland, however, and we need to take a look at them. You may have noticed some commands in the File and Edit menus that sound a little strange. There are, in fact, seven commands that cryptically reference "recipe." Well, DPP keeps a running tab on all the changes that are made to an image until it's finished and converted to a Tiff of jpeg. The final version of all changes made to an image can be saved and, like a recipe, applied to another image to make a new one that's just as tasty as the first. It took several minutes to get this particular effect, and I often reset a control because I didn't like what I saw. I radically changed the dynamic range, exposure, contrast, individual RGB channels as well as the entire RGB tone curve. Before converting it to a .tif, I selected Edit>Save Recipe in File, named it, selected a location for it (I created a Recipe Folder), and clicked Save. That's it. Now I can apply this recipe to any photo I wish, now or in the future FIG9.53). Although DPP was developed as a high-end tool for RAW file conversion, it functions quite well, but with limitations, as an editing and image enhancing program for .jpg and .tif files as well. You can only use the RGB Image Adjustment window and palette, but you can make changes to one image, then apply it to others via a recipe. Like working with RAW file data, changes made to Tiffs or Jpegs are only made when selected images are processed. The original image data remains intact. To use the recipe (or any other that's been saved in the created Recipe folder), first select a new photo in the Edit window or in another RAW file folder. Go to Edit>Read and Paste Recipe from File ..., and select the proper file and recipe. Go back to Edit>Paste Recipe to Selected Image. The entire conversion process, which perfectly matched the first image, took less than ten seconds. Note: Any color differences between these two images is because this image is a screengrab :IG9.54). 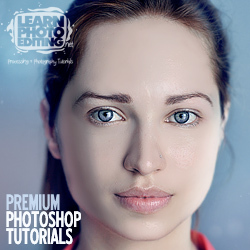 DPP can also trim your images on the fly, to any aspect ratio you wish, by using the Trimming tool found under the Tools menu. Calling up that tool will send your selected image to a new window, where you'll see the Aspect Ratio palette. You can choose from a number of presets or select Custom and simply type in the dimensions you need. 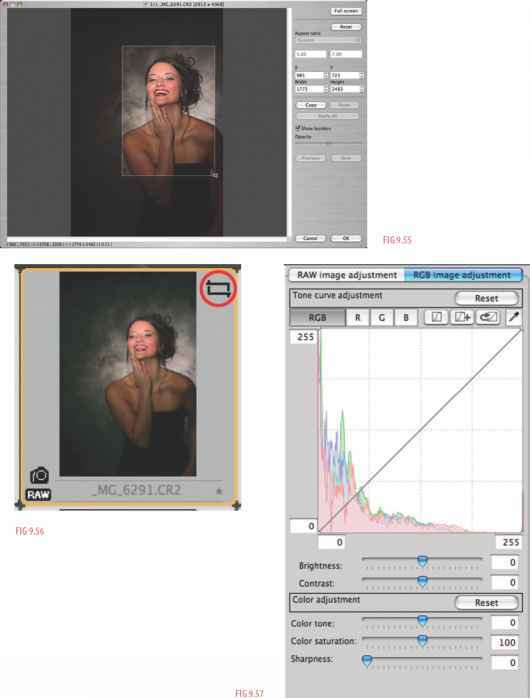 If you want to crop without a ratio, just select Free and crop as you wish FIG 9.55). 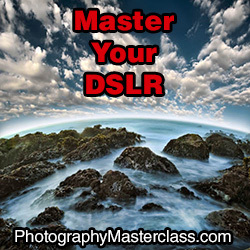 Unless you return to the last saved settings or revert to the image's shot settings, DPP will produce a trimmed file each time you process that file from now on. You can easily tell if the image has been trimmed by looking for the Trim icon in the Main or Edit window. You'll find it in the upper right corner of the thumbnail (FIG 9.56). How to adjust rgb in dslr? How to balance RGB in canon 500d?